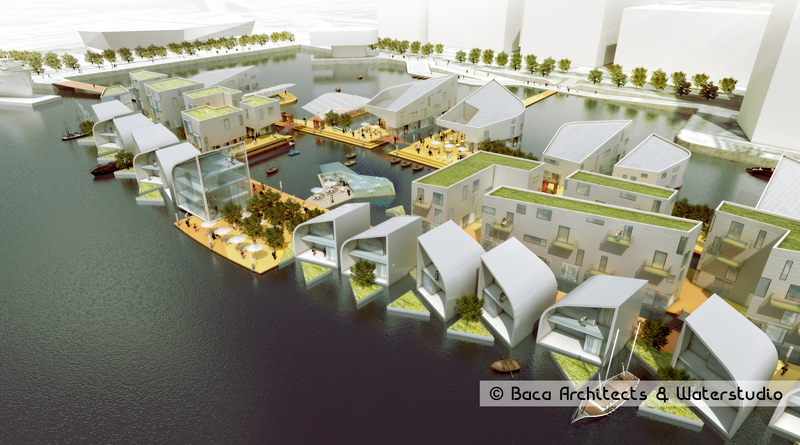 Baca Architects are runner-up in an ambitious plan to build a floating village in London’s Royal Docks, as part of the Mayor of London’s Vision. The team, led by Hadley Mace, developed plans for a floating village conceived as a ‘Crown’ in the Royal Docks. It would form the head of a future necklace of floating settlements that could extend throughout the Docks along a watery ‘Champs Elysee’ boulevard. A fundamental approach to Baca’s plan was that the development should not be an extension of the dock edge. Rather, it should be set away from the dock edge and surrounded by a ‘blue belt’, to provide space to breathe and express the unique ‘aquatecture’. The village design has the bold ambition of the original dock builders and would be innovative, inspirational and iconic: a legacy that future generations could be proud of. Designed and built in Britain, the HM team’s approach was to make a uniquely British floating village, both bold and playful. Their floating village design contains all the components one would expect from a quintessential British village but on water, with small local stores, a village hall/gallery, and even a floating village pub set on the edge of the village blue. ‘Though, sadly, the public were not invited to comment on the shortlisted proposals, hopefully there will be a chance to input into this important new London landmark in due course.’ Baca still plan to build a British floating village somewhere else in the UK.